On this day in 1949, the United Nations Security Council adopted a resolution, acknowledging the Kashmiris’ right of self-determination. Srinagar, January 05 (KMS): In occupied Kashmir, senior APHC leader and the President of Anjuman Shari Shian, Agha Syed Hassan Al-Moosvi Al-Safvi, has said that unresolved Kashmir dispute posed serious threat to peace and stability in South Asia. Srinagar, January 05 (KMS): In occupied Kashmir, Hurriyat leaders and organizations have paid glowing tributes to the victims of Sopore massacre on the eve of their martyrdom anniversary. 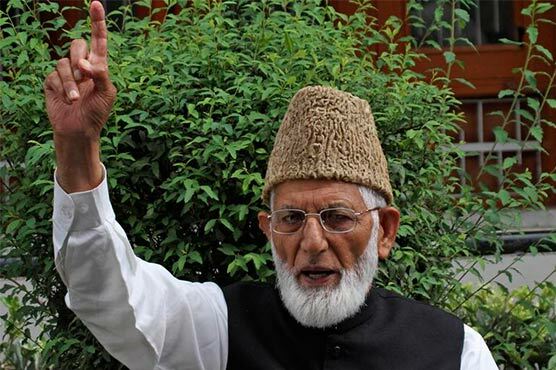 Srinagar, January 05 (KMS): In occupied Kashmir, the Chairman of All Parties Hurriyat Conference, Syed Ali Gilani, has said that India cannot deny the legitimacy and authenticity of the UN resolutions as these stand witness that political destiny of Jammu and Kashmir is yet to be decided. Jammu, January 05 (KMS): In occupied Kashmir, the Jammu and Kashmir Peoples Movement (JKPM) has expressed serious concern over the plight of Kashmiri political detainees languishing in different jails of India and the territory. Srinagar, January 05 (KMS): In occupied Kashmir, senior Indian journalist and editor of TheWire.in, Siddharth Varadarajan, was left red-faced when he was reprimanded by Kashmiri intellectual, Professor Hameeda Nayeem, for speaking Indian state’s language on the Kashmir dispute. Islamabad, January 05 (KMS): A seminar was held under the auspices of the All Parties Hurriyet Conference Azad Jammu and Kashmir chapter (APHC-AJK) in Islamabad, today, to mark the passing of a resolution on Kashmir by the UN on this day in 1949. The resolution has called for settling the Kashmir dispute by giving the Kashmiris their inalienable right to self-determination. Srinagar, January 05 (KMS): In occupied Kashmir, Indian police arrested the Jammu and Kashmir Peoples League (JKPL) Chairman, Mukhtar Ahmad Waza, today, and lodged him at Sherbagh police station in Islamabad town. Srinagar, January 05 (KMS): In occupied Kashmir, a Right to Information (RTI) application has found that even after four decades, there are no rules or Standard Operating Procedures (SOPs) for ordering preventive detentions under draconian law, Public Safety Act. Toronto, January 05 (KMS): ‘Made in China’ globes being sold at leading Canadian stores depict Jammu and Kashmir as a disputed area and Arunachal Pradesh as a part of China. Pictures of the globes being sold at the multinational retail chain, Costco stores, in Canada have gone viral on social media.